In the closing weeks of 2012, tenants in the City of Los Angeles were provided some holiday presents with two separate unanimous votes by the LA City Council to adopt laws protecting renters. The Coalition for Economic Survival (CES) was the main advocate in securing these important laws. First, On December 11, 2012, the Los Angeles City Council voted to extend the City’s Foreclosure Eviction Ordinance, proposed by LA City Council Member Eric Garcetti, to protect tenants living in rental properties not subject to the City’s Rent Stabilization Ordinance (RSO) from eviction on the grounds of foreclosure for another year. This Ordinance prohibits lenders from evicting any tenants in the City merely because of foreclosure on their landlords. Tenants living in rent controlled units have had these protections. 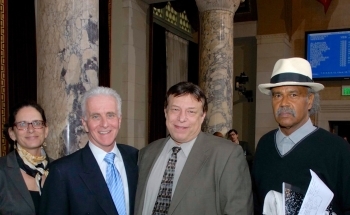 Days after the L.A. City Council then voted on December 14, 2012 in support of an ordinance introduced by Councilmember Paul Krekorian, in response to CES’ urging, to prohibit landlords from demanding that their tenants pay their rent only online. The ordinance mirrors a state law (SB 1055) authored by California State Senator Ted Lieu (D-Torrance) that goes into effect on January 1, 2013, which provides protections to all California tenants. 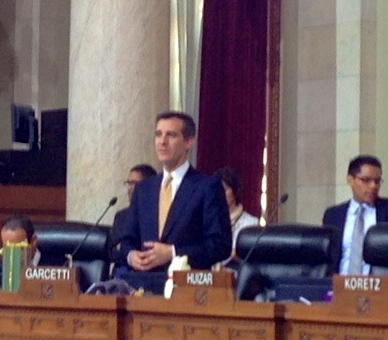 The LA ordinance will enable the Los Angeles Housing Department to enforce the law locally.